Peachtree Publishing Company, 9781561458523, 36pp. Abraham Lincoln was known for his sense of humor. But in 1842, early in his adult life, it nearly got him into trouble. He had to use his imagination to save his career--and maybe even his life. When Abraham Lincoln became frustrated with the actions of James Shield, a political rival, he came up with a plan. It was silly. It was clever. And it was a great big mistake Lincoln, his future wife, and a friend of hers wrote a series of fictional letters to the editor, complaining about Shields. But when Shields took offense, he challenged Lincoln to a duel. How would our future president straighten things out and save the lives and careers of both himself and his rival? Donna Bowman's humorous voice and S.D. 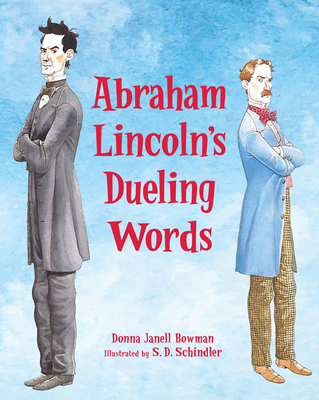 Schindler's expressive illustrations are the perfect match for this story of Abraham Lincoln's humor and wit. Back matter includes an author's note with a bibliography.